I know everyone is focused on the hurricanes (as we should be) but I figured we could also start talking a little about the fall. 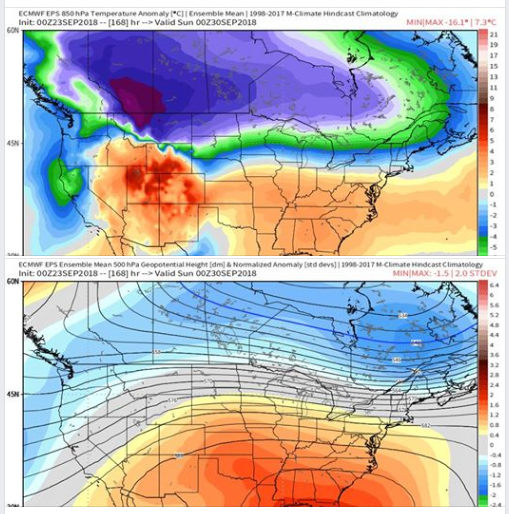 The GFS finally has a pattern shift to cooler temperatures for the SE way out in voodooland. But it's still nice to see temps in the lower 60s and DPs down in the 50s after months of 90s and 70s respectively. That sounds divine. I know we had that little tease a few weeks ago and it was nice to enjoy the afternoon without breaking a sweat. I know there are some student athletes that are excited to have it as well. Some seasonal analogs I've heard being talked about point towards potentially an active cool-season severe pattern as well. Could be an interesting fall as I've heard some comparisons to 1989, 2002, and 2004 among others. It's nice to see the cooler temps building 'up north'. But, the ridge looks strong & will continue to block that cooler air from moving South. It will be nice (more than nice) when the ridge breaks down. This late September humidity here in the Southeast is making me cranky. Some much needed heavy rain here since this morning.I just wish the cool weather would follow. We'll get a cooldown the rest of the week with highs staying in the low 80s and lows in the low 60s. Not as extreme as previously mentioned (Which is typical), but still a nice break. FWIW, the 12z GFS has it getting downright COLD in mid-October towards the end of its run.. but who knows whether or not that is going to hold at all. I'm happy to report a measurable amount of rain falling in 30132. It's been a while! Considering I'm on a well, I start getting worried when we go weeks with no rain! Looks like the GFS is bringing in cooler/drier (mostly drier) weather this next weekend, and sticking with it. It seems from back when I started this thread until now, the GFS kept the drier air out in voodoo land and never let it get closer than 300 hours out. Looks like the cooler weather is officially upon us in Dixie. My wife opened the doors and windows and now I'm getting the annual ragweed reaction. And just like that, Alabama has Fall for 2.5 days! !